Puppies LOVE Real Food too! Save money and pamper your puppy with healthy, homemade doggy treats that are tail-waggin’ good! Just look at that sweet little face, so patiently waiting for his yummy sweet potato snack! Last November, we were blessed with an adorable little bundle of fun – Franklin Jr,. our English Bulldog puppy! He’s definitely been a joyful addition to our family, so of course we want to feed him right so we can enjoy many years to come with this cute little bag of wrinkles! As a new puppy owner (in fact, this is my first dog ever! ), I was shocked at how expensive quality puppy treats are (if you can actually find real food based dog treats). So in an effort to save our budget, and still have a tempting treat to reward our good boy, I decided to bake-up some easy and healthy real food doggie treats. Because our little guy is eating a grain-free diet, I wasn’t up for lengthy experiments to create a homemade GF dog biscuit (at least not yet). 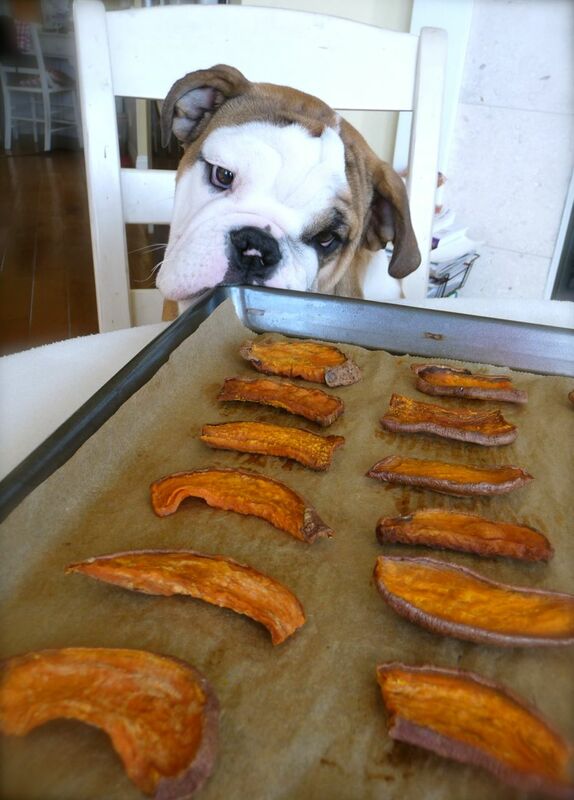 That’s why I opted instead to start by making one of his favorite simple treats – chewy dried sweet potatoes. Come on … they look ready to eat to me … Can I have one … P L E A S E ! What’s a guy gotta do to get one of these?? Oh yeah! You bet I’ll sit for one of these yummy wholesome treats! YUM! Victory is mine … at last! Rinse and dry the sweet potatoes. Then, slice them into 1/3-inch slices. 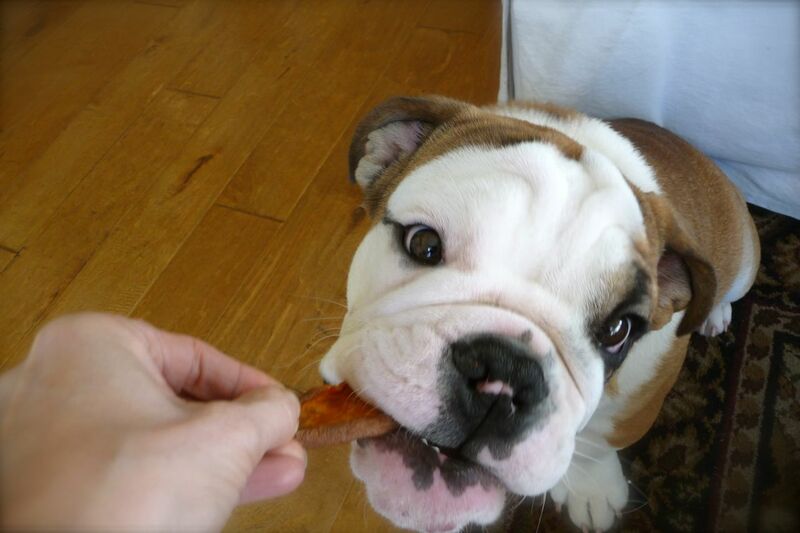 I prefer to slice them lengthwise, so our puppy can hold down one end of the dried sweet potato with his big beefy paw, while gnawing on the other end – it’s just so cute to watch! There are two options for drying fruits and veggies. The best method to use is a food dehydrator. Dehydrators use very low temperatures over a long period of time to remove moisture from foods. This “low and slow” method helps retain more nutrients and enzymes for best nutritional value. However, if you’re like me and the food dehydrator is still on your “wish list.” Then you can certainly use your oven to slow dry them. 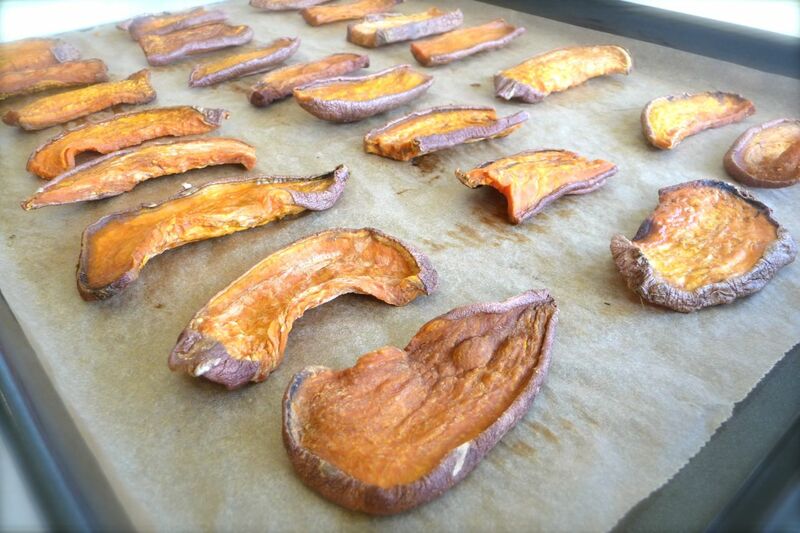 Simply, place the sweet potato slices on a parchment-lined baking sheet and bake at 175 degrees about 6-10 hours. Be sure to check for doneness about every 1-2 hours after you hit the 4-hour mark. If you have a convention oven, definitely use convection-bake, as it will save significant time since convention more evenly distributes heat. The sweet potato treats are done when they have shriveled to almost half their original size and are somewhat dry-rubbery. If you’re not sure, take one out, let it cool. If it’s dry-rubbery in texture, then it’s done. I prefer to serve my puppy a chewy-style treat, over a crisp one. So I don’t recommend baking them until they are too dry, otherwise the sweet potatoes become too crisp and crunchy. 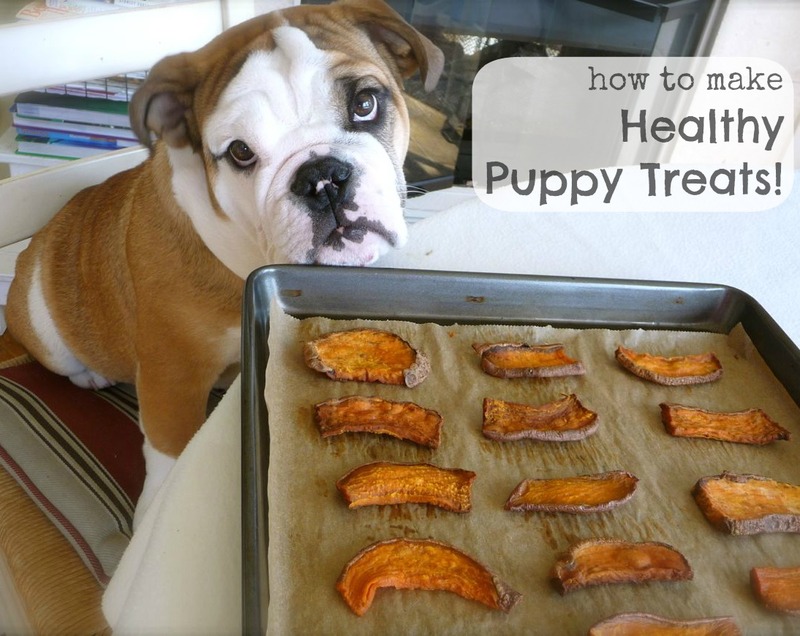 Slow dried sweet potatoes are a nutritious and delicious way to reward your good puppy! They’re a much safer, all-natural and completely digestible alternative to rawhide. While dried sweet potatoes and other dried fruits and veggies have numerous health benefits, the process of drying them (especially depending on the temperature used) can reduce their nutrient value. However, compared with the majority of dog treats on the market, homemade dried fruits and veggies make a great all-natural puppy treat – just remember moderation is key! 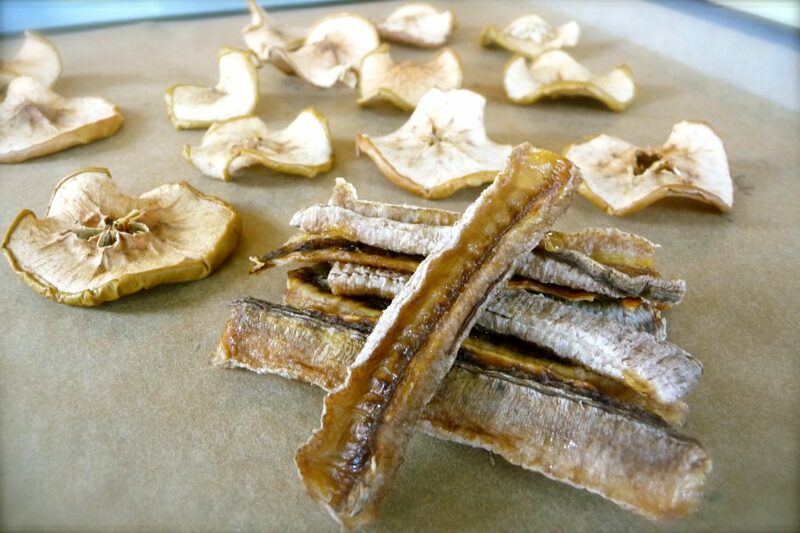 Dried apple and banana slices also make a wonderfully wholesome real food treat for puppies and people too! Use the same process as above, keeping in mind that baking/dehydrating times vary based on the thickness of the slice and moisture level of the fruit or veggie. Brilliant! 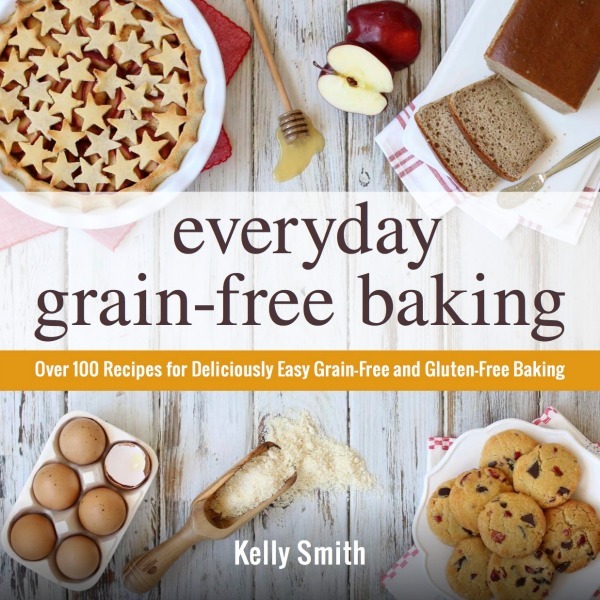 I came across this feature on Pinterest and clicked through quickly as I’ve been on the lookout for such a recipe. Harley the Wheaten Terrier came into our lives last summer as a 10 week old puppy. 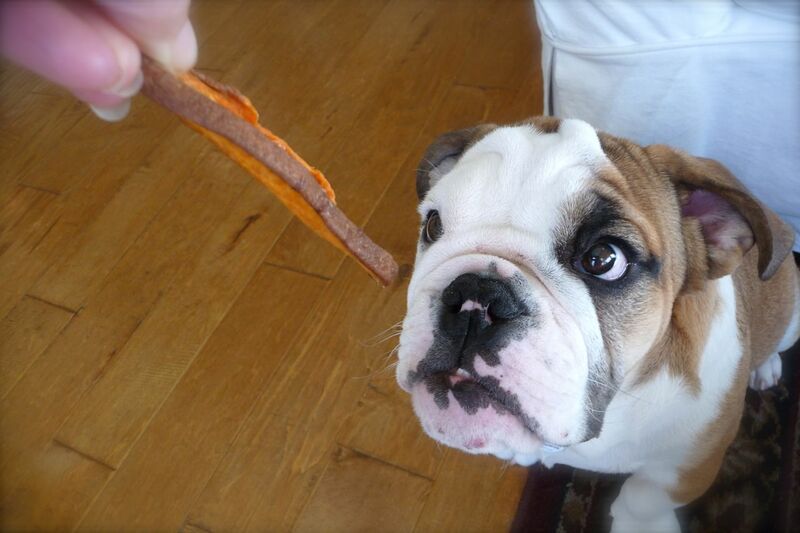 At his puppy class the trainer suggested Sam’s Yams as a nutritious yet chewy, gratifying treat. I picked up a pack but gasped at the price…for dried sweet potatoes!! I switched to a cheaper pack but found out they were made in China and treated with something that gave Harls the runs. There’s no way I could keep buying the Sam’s Yams at the high price and wondered if I could make my own. All the recipes I’ve seen online utilize a food dehydrator which I have no room for in my small kitchen. Three cheers for this recipe! I’ll be making these tomorrow. Thank you for sharing. It is definitely well! God Bless! I just love Frankie’s wrinkles. 🙂 I’ve never made Cookie treats since she’s happy munching on kale stems (seriously), but I love the idea of giving her dehydrated sweet potato treats. She is always stealing little strips of sweet potato skin when I peel them, so I know she’d love them. Congratulations on your first dog – you realise they are adictive and having got one you will never be without in the future!! 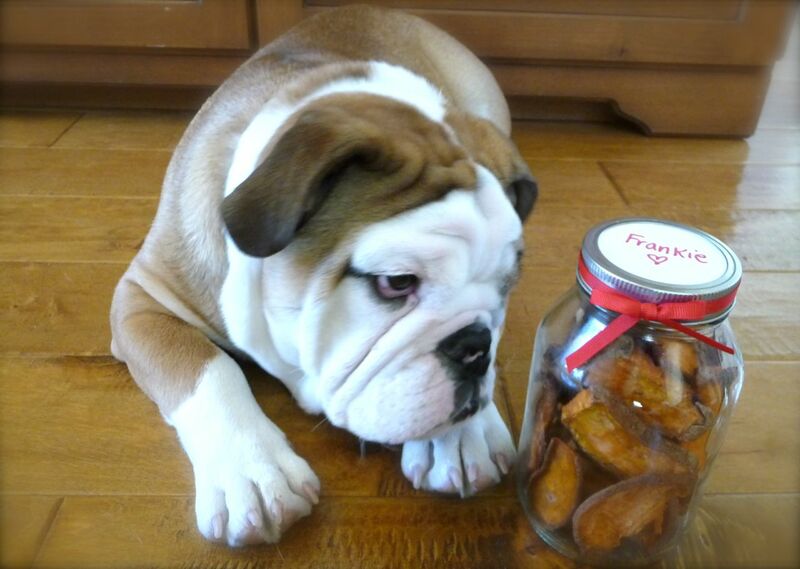 I love the idea of these Treats – Tiger would love them as he chews everything in sight – he is teething!! My main problem with pet foods generally and treats also is not only the cost but also the rubbish that goes into them. Tiger is alergic to chicken – and reading the ingredients on dog foods – everything has chicken – no matter if its beef strips, or fish for dogs or what ever – it contains chicken – and in the dry food – everything has poultry oil or poultry meat in it!! And we can guess its not free range organic chickens that are used!! Putting him onto a no processed foods grain free diet he is flourishing, no more itches and scratching and biting of his feet, he is now a “normal” pup.